For most people, the holidays are a time of celebration and joy. They are filled with family, friends, and activities that help make memories that will last a lifetime. Other people, though, see the holidays as a time of opportunity. They are on the lookout for ways to exploit any weaknesses that could be beneficial to them. Here’s how to protect yourself and what’s important to you. This holiday season, think in terms of home security when purchasing a gift for that person who’s difficult to buy for. Don’t leave yourself out of this category either. Receiving items such as motion-activated webcams, sensor-based lighting, and smart phone home security are proactive methods of staying protected this holiday season. Social media does more than keep you connected with those far-flung people you love. It can also give thieves the opening they need to burglarize your home. In fact, 78 percent used social media to target properties. Wait until you’re back home to post status updates about your activities — or better yet allow only a narrow group of people to have that intimate glimpse into your daily whereabouts. Don’t give passersby and nosy neighbors something to see. Keep your curtains pulled when you go to sleep at night. Make sure that your garage door is in good repair to cut off an avenue of access to your home. If you’re like many other parents, your garage holds a treasure trove of items and makes the perfect place to hide holiday presents. Hide your garage door opener in your car while your car is parked outside. 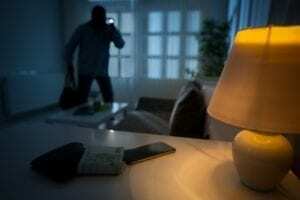 Doing so reduces the chances that a thief can enter your home. If you hang lights from your home or decorate mature trees in your yard, you probably used a ladder to facilitate these activities. Be sure to remove and secure any ladders to prevent giving potential thieves ideas on how to more easily enter your home. Americans today have a vast amount of possessions. Often, they don’t even realize the number of valuable belongings that they keep in their homes. Trying to recall the details of these items can be difficult when you’re also stressed about being burglarized. Be proactive and keep a running inventory — with complete details and pictures — before something happens. The above steps are ones that are simple and can be easily integrated into your everyday activities. Taking a few extra minutes and taking steps to protect yourself now can result in a huge payoff down the road and increased security for today.